FERGAL Smith was destined to turn his hand to growing vegetables and various fruits at some stage. Living in North Clare for eight years, the Mayo man grew up on an organic vegetable farm before embarking on a professional surfing career for several years. These days, he is one of the key figures behind the operation of the Moy Hill Community Garden project, which is located close to Lahinch. The project has entered the Get Involved initiative, a competition run by 51 local newspapers throughout Ireland. The aim is that the national competition will drive voluntary sustainability projects, where local people collectively play a more proactive, inclusive and coherent role in shaping the future of their local environs. Before setting in Lahinch, Fergal learned his trade further up the west coast. “My dad is an organic vegetable farmer. He’s been at it 30 years. He started the country markets in Westport. So, I grew up with that. He got into surfing just to have a break from the farm. Then me and my brother copied him and we used to go to Achill Island at the weekend. We were on the farm all the time but I just wanted to go surfing so, as soon as I could, I was gone. I was mad for surfing so that was me for the last 10 years,” he explained, while working in an underground glass house in the community garden. “I’d stay in Ireland from September to May for the winter waves but as soon as the waves stopped here, I’d be off to the southern hemisphere. I used to spend a good few months in western Australia and then go to Tahiti a lot as well. About four or five years ago, I had to decide long term what I wanted to do. I wanted to grow my own food but you can’t do that if you’re on the other side of the world. I’ve been living down here for eight years and I wanted to get to know the community. 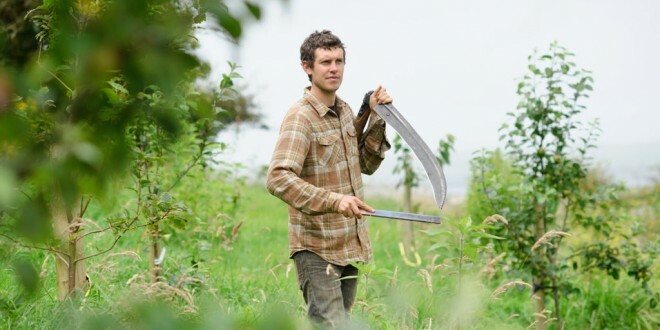 Realistically, I’m going to be gardening and farming for the rest of my days,” Fergal predicted. The community garden project is now in its second year and the plan is that it will expand in a sustainable manner. “I met Antoine O’Looney one day. He said we could use this half acre so we got stuck in. The initial idea was to clear it, plant an orchard and if anyone wants to learn a thing or two, great. Antoine then also offered an acre down by Moy House. I left the vegetables down there and this is the orchard. Last year was our first year. People come to help and learn. We bring them up on a Friday and we have a cook-up in the garden. We cook whatever is in season and whatever is available down in the field. Yesterday we brought up a big salad and made a spinach soup,” he explained. Fergal, whose wife and daughter also work in the garden, is trying to balance making a living from the garden, while avoiding mass production. “I’m getting into how do I want to make a living out of it. Last year was more of an experiment. This idea of working all day and not making any money is a classic farming trait. I don’t mind making no money but I don’t want to be stuck to it all day, every day. The idea is to work with the community. That way you’ve got more labour and you’re less on your own. It’s more fun teaching people,” he feels. Along with a few friends, Fergal is planning to purchase 17 acres of land, some of which is bogland but it contains some land suitable for growing vegetables. “We’re moving out of Moy House and we’re buying our own land, just up the road from here. I’m buying it with five friends. It’s 17 acres and is purely an agricultural project. There is a nice two acre field and we’ll use that for the vegetables,” he confirmed. The nearby half acre orchard, which contains the underground glasshouse, is now owned by Fergal and his group. “We’ve bought this half acre from Antoine. We’re currently piloting a box scheme. The idea is that whatever is in season, it’ll go into the box for a set price. At the moment we’re doing a small box for €10. Throughout the summer it’ll be more and in the winter it’ll be less but it balances out. The idea I like about it is we have members not customers. It’s like having a family farmer. They can come down any time and we’ll have lots of open days,” he said. An assortment of friends supply eggs, goats cheese and sourdough bread, which adds to the variety and depth of the available produce. While he explained the project concept to The Clare Champion, Fergal continues to tend to the underground glasshouse produce. “I had this idea for years but never thought we’d do it. We had no machinery but one day we had to dig drains. A friend with a mini-digger came up and did it. While he was here he dug this glasshouse out. They have them in deserts, where you have extreme heat or cold. When you’re under ground it regulates everything,” he noted, adding that the glasshouse is home to an avocado tree, an apricot tree and grows peaches, ginger, kiwi, lemon and fig, along with tomatoes, cucumbers and aubergines. “It won’t blow away, which is a massive thing in Ireland. There was a frost in early May and we didn’t get anything in here,” he said. Elsewhere, the orchard includes a variety of apple trees, while herbs, flowers and a tree nursery also feature, along with a pond. Since the beginning of Get Involved in 2013, many communities built the foundations for future projects and there is an expectation of seeing them back again this year for the next stages of their projects. This year there is €12,000 worth of bursaries available to winning projects, so there is an expectation that there will be a record number of projects participating. Get Involved 2015 sets out to inspire and stimulate community collaboration through voluntary efforts and to foster ‘green’ and ‘social impact’ enterprises, to build local resilience and generate new and sustainable livelihoods.